Memphis’ music roots run deep, but the beat goes on all over the city! Blues bar after blues bar can be found on Beale Street, and even places where you don’t expect music seem to sneak in a little blues, folk, soul, rock, pop or world beat every weekend. Explore three of Memphis's coolest neighborhoods (Overton Square, Cooper Young, and Downtown's Beale Street) in search of places to experience the sounds of the city. Overton Square’s revival, which has been gaining momentum since 2012, has brought an increase in places to hear today’s up and comers! Lafayette’s Music Room, where Billy Joel got started, hosts live music every night (and often during the day and Sunday brunch), and includes tons of local, regional and national touring musicians. Longtime Zebra Lounge employee Michael Vaughn opened his second location (Chicago has the original) in 2014 in a historic landmark building. This is where local singing pianists strut their stuff! Near the Square, Minglewood Hall--which inspired the original “Minglewood Blues” recording in 1928—is a favorite local spot to catch some live tunes while in town. Check out their schedule to see who will be paying, and nab tickets in advance. A more intimate venue inside Minglewood Hall, The 1884 Lounge focuses on promoting some of the best local and regional musicians. It’s a seriously cool space to catch a show, and if you’re looking to listen to music like a local, this is the best place to go. Overton Park is home to Levitt Shell, an outdoor amphitheater that hosts 50 free concerts a year, as well as other shows and performances. History buffs and rock aficionados should note that this is also the venue where Elvis performed his first professional (paid) rock show. Shangri-La Records gets press from journalists all over the world because it’s just that cool. Inside, you’ll find a massive selection of used and new records, mostly in the soul, funk, rock, jazz, and blues realm. Browse the selection of CDs, LPs, and other music-themed items, and if you’re lucky, you can catch one of the occasional free concerts on the porch by local artists in honor of new releases. Cooper-Young Historic District is one of Memphis’s most vibrant neighborhoods. Located in Midtown, Cooper-Young is filled with history (Johnny Cash played shows here), personality (look no further than the colorful murals or the quirky storefronts), and a plethora of some of Memphis’s best bars, shops, restaurants, and, of course, music venues. If you’re looking to make a night out of seeing a show, head to Bar DKDC. With a menu of small plates inspired by international street food (think, tamales, spring rolls, souvlaki, and corn dogs) and a cocktail list of delicious, hand-crafted drinks (order the Greenline, inspired by Memphis’s beloved 6.5-mile urban trail) you’ll be able to fill up before catching a show here— they feature lots of local and regional artists with funky vibes. Snaps from their vintage photo booth make a great souvenir of the night! Goner Records is a one-stop shop for Memphis music. They have a shrine to Elvis impersonators (admission is a mere 25 cents), new and used records, and they even act as their own label, releasing music from some of the coolest local artists. Goner Records sponsors shows across Cooper-Young and puts on September’s Gonerfest, which draws a global showing of fans and bands; the fest takes place in various Midtown venues. The Memphis Drum Shop attracts all the star drummers when they’re in town to play. Even if you aren’t a percussionist, you can check out their collection of vintage drum catalogues, their vintage instruments, their apparel and musical accessories, and their massive cymbal vault. The staff are all super helpful, so if you’re looking to start your rocking career as a drummer, they offer lessons and instructional videos and can help you find the right set for your needs. Beale Street is the most obvious place to go to catch some live music… but just because it’s the most popular destination doesn’t mean the music is any less authentic. The street has several blocks of Southern eateries, shops, bars, and, of course, blues clubs that have showcased the talents of greats like W.C. Handy, B.B. King, Rufus Thomas, Willie Mitchell and Isaac Hayes. Music spills onto the street from the clubs, and the atmosphere is always lively: be ready to dance the night away! If you’re exploring Beale Street while the sun is still out, take advantage of the fact that the Memphis Rock ’n’ Soul Museum is located in the neighborhood and pop in to learn all about how Memphis became synonymous with rock, blues, and soul. Learn about rock’s roots and soul’s past by listening your way through history and checking out some pretty incredible artifacts here— it’ll help you appreciate the live music you’ll hear all over Beale Street that much more! Located inside the groovin’ Rum Boogie Cafe, this little venue is a hidden gem that boasts some of the best live blues on Beale. Grab a cold beer and let your feet tap along to the music as you soak in the atmosphere and character of this intimate concert space that lets you get up-close and personal with the sound. This is the original B.B. 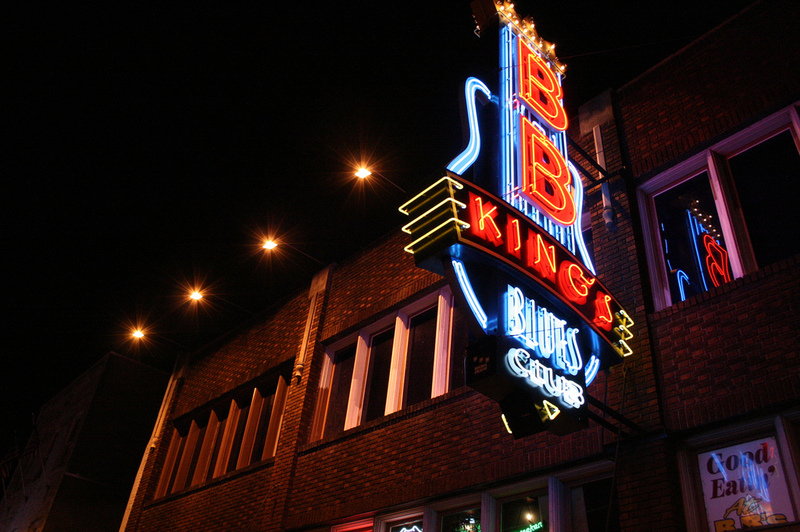 Kings Blues Club location, and it serves up soul food and flavorful barbecue to enjoy with the rockin’ live music. The place feels like an authentic blues club, but they have a state-of-the-art sound system that really lets you experience the music. This place gets crowded (but with good reason) and the audience is always lively: be prepared to do some dancing while you’re here! The right instrument is key to nailing that soulful Memphis sound. At the Gibson Guitar Factory, you can see just how much attention to detail goes into crafting each and every guitar they sell. You don’t need to be a rockstar to appreciate the 45-minute factory tour here, which ends in the shop where you can test drive one of the guitars yourself! If you want to see what Beale Street was like back when it was in its heyday, head to the W.C. Handy House Museum. The turn-of-the-century shotgun was home to William Christopher Handy, the Father of the Blues, in the early 1900’s. The building was moved from its original location in South Memphis to Beale Street to be closer to the action that inspired many of Handy’s songs. You can really feel the history here as you observe artifacts and displays about Handy’s life and music. The building where Memphis’s Hard Rock Cafe is now located has spent time as a saloon and a recording studio, so it’s a fitting stop on your tour of music in Memphis. They feature occasional live shows, a great bar, and (best of all) a weekend Blues Brunch that’s perfect for setting the tone for a day exploring the sounds and soul of Memphis.